Straight-awned spineflower (Chorizanthe rectispina) habitat. 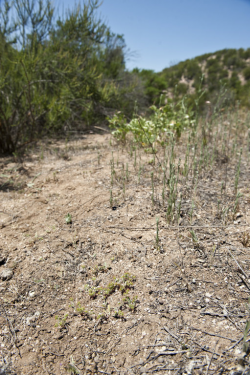 In chaparral openings in coarse, sandy soils, along Highway 58, San Luis Obispo County, CA, April 26, 2013. Photo © 2013 Chris Winchell. Straight-awned spineflower (Chorizanthe rectispina) habitat, In chaparral openings in coarse, sandy soils, Highway 58, San Luis Obispo County, April 26, 2013. Photo © 2013 Chris Winchell. Straight-awned spineflower (Chorizanthe rectispina) growth habit, San Luis Obispo County, April 26, 2013. Photo © 2013 Chris Winchell. Straight-awned spineflower (Chorizanthe rectispina) inflorescence, San Luis Obispo County, April 26, 2013. Photo © 2013 Chris Winchell. Straight-awned spineflower (Chorizanthe rectispina) flower, San Luis Obispo County, April 26, 2013. Photo © 2013 Chris Winchell. Straight-awned spineflower occurs on flats or slopes; in grassland, coastal scrub, chaparral, or oak-pine woodland. Substrates include granitic sand, gravel, or rocks, and white, disintegrating-gravelly shale (Lockwood shaly loam) formed in alluvium derived from siliceous shale; 200–600 m (USDA 1978, Reveal & Rosatti 2014, CNDDB 2018, Keil unpublished). Plants annual, spreading to generally decumbent, to 1 dm. Inforescence bracts 2, opposite; involucre 3-angled, 6-ribbed, teeth 6, abaxial longest, awns 0.3-2.5 mm long, anterior awn >> other awns. Flower hairy; perianth 2-colored, tube yellow, outer lobes white, entire or ±2-lobed, inner lobes shorter, yellow, erose apically; stamens 9. n=(18)20(22) (Reveal and Rosatti 2014). The similar-looking one-awn spineflower (Chorizanthe uniaristata) has 3 stamens, and outer perianth lobes with 1 or 3 teeth, inner entire. Range: s SN, e CW, n WTR (Reveal and Rosatti 2014). Straight-awned spineflower is infrequent yet highly localized in the outer South Coast Ranges (SCoRO) of southern Monterey and northern San Luis Obispo counties, California. In their 1989 “Revision of the Annual Species of Chorizanthe,” James L. Reveal (3) and Clare B. Hardham (4) retained section Uniaristatae (5),but placed C. rectispinainto their new subsection Petasata (6) (meaning “with a hat on, alluding to the dense, colorful flat-topped inflorescences”) of section Herbaceae Benth.—along with C. biloba [SCoR, 1B.2]; C. blakleyi [s SCoRO, 1B.3] (7); C. obovata [s SCoRO]; and C. ventricosa [SCoRI, 4.3, serpentine endemic]. The authors mention that Philip A. Munz (1958, 1959) had “either reduced in rank or submerged into synonymy most of the species in this subsection,” but later changed his opinion (1968). Hardham (1989) suspected C. rectispina “of having been involved in episodes of hybridization with C. clevelandii to give C. uniaristata, with C. palmeri to give C. ventricosa, and with C. biloba to give local hybrid populations.” She notes that she found C. rectispina growing with C. biloba [at Black Mountain, La Panza Range, San Luis Obispo County] and C. obovata. It is also known to grow with C. staticoides and C. diffusa (CNDDB 2018). 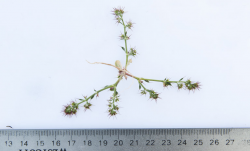 The CNDDB (2018) reports 38 occurrences of straight-awned spineflower with 10 located in Santa Barbara County, 22 in San Luis Obispo County, and the remaining six in Monterey County. 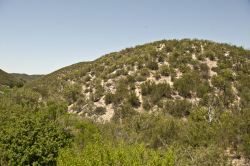 Two of the Monterey County occurrences are on private land and are threatened with bulldozing and development. One of them was last surveyed for in 2005, with only 25 plants present, while the other has not been censused since 1985. Two other roadside occurrences are based on old collections and have not been relocated. These occurrences are likely threatened with road-maintenance and herbicide use. One occurrence based on a 2005 collection is on Camp Roberts and requires fieldwork as no other information is available. The final occurrence noted in CNDDB, based on a 1990 collection, is on BLM land and also requires fieldwork to document current conditions. As populations are small throughout the range of this species, they are likely threatened with invasive, non-native species and are subject to random, stochastic events. 1. Edward Palmer (1831–1911) was a consummate naturalist, making collections of plants, mammals, and Indian artifacts in South America, the western United States, and Mexico (Tiehm 1996). His name is commemorated in the names of many plants, including Chorizanthe palmeri. 2. “The McGuiness Ranch was probably at the head of Rocky Canyon southeast of Atascadero along an old road between Creston and San Luis Obispo that was used to haul wheat” (Reveal and Hardham 1989). 3. James L. Reveal (1941–2015), one of the botanical titans of the 20th and 21st centuries, specialized in Eriogonum and its relatives and also published prodigiously on botanical history, nomenclature, western North American floristics, plant conservation, and Angiosperm classification. 4. Clare B. Hardham (1918–2010) was a Paso Robles botanist who collected widely in the South Coast Ranges in the 1950s and 1960s. California Native Plant Society (CNPS), Rare Plant Program. 2017. Chorizanthe rectispina. 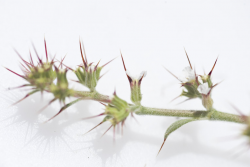 Inventory of Rare and Endangered Plants (online edition, v8-02); entry last updated 2015-01-26. California Native Plant Society, Sacramento, CA. http://www.rareplants.cnps.org/detail/1619.html [acc. 16 Aug 2018]. California Natural Diversity Database (CNDDB). 2017. [Internet]. California Department of Fish and Wildlife [acc. 17 May 2018]. Goodman, G. J. 1934. A revision of the North American species of the genus Chorizanthe. Annals of the Missouri Botanic Garden 21:1–102. Hardham, C. B. 1964. Chorizanthe blakleyi. Leaflets of Western Botany 10:95. Hardham, C. B. 1989. Chromosome numbers of some annual species of Chorizanthe and related genera (Polygonaceae: Eriogonoideae). Phytologia 66(2):89–94. Kempton, E. A. 2012. Systematics of Eriogonoideae s. s. (Polygonaceae). Systematic Botany 37(3):723–737. Munz, P. A. 1958. Aliso 4(1)89. Munz. P. A. 1959. A California Flora. University of California Press, Berkeley, CA. Munz. P. A. 1968. Supplement to a California Flora. University of California Press, Berkeley, CA. Reveal, J. L. 2001. Taxonomic treatment of Eriogonoideae (Polygonaceae), Chorizanthe rectispina. University of Maryland. http://www.plantsystematics.org/reveal/pbio/eriog/choriz/rectispina.html [acc. 16 Aug 2018]. Reveal, J. L. 2005. Chorizanthe, in Flora of North America Editorial Committee, eds. 1993+, Flora of North America North of Mexico, Vol. 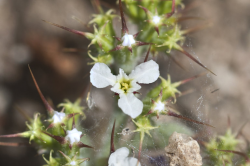 5. http://www.efloras.org/florataxon.aspx?flora_id=1&taxon_id=250060060 [acc. 16 Aug 2018]. Reveal, J. L. and C. B. Hardham. 1989. A revision of the annual species of Chorizanthe (Polygonaceae: Eriogonoideae). Phytologia 66(2):137–139. Reveal, J. L. and T. J. Rosatti. 2014. 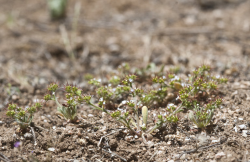 Chorizanthe rectispina, in Jepson Flora Project (eds. ), Jepson eFlora, Revision 2, http://ucjeps.berkeley.edu/eflora/eflora_display.php?tid=19353 [acc. 16 Aug 2018]. Tiehm, A. 1996. Nevada Vascular Plant Types and Their Collectors. Memoirs of The New York Botanical Garden 77. The New York Botanical Garden, Bronx, NY. United States Departent of Agriculture (USDA), Soil Conservation Service. 1978. Soil Survey of Monterey County, California.